From storing your donor data to automating marketing to identifying important fundraising opportunities, an ideal CRM software solution should accomplish multiple tasks at once. Having an organized way to compile, search, and (most importantly) use your data is key to making the informed decisions that translate to sustained success. For instance, let’s say your nonprofit conducts a successful peer-to-peer fundraising campaign. Without a strong CRM software solution ready to catch all that valuable data you collect from volunteers and new donors, you’re only getting half the real impact from your successful campaign! The field of CRM software is immense, so the challenge is to find solutions that directly address the needs of nonprofit organizations. Don’t settle for the dominant CRM tools that aren’t designed for nonprofits! Whatever your exact need, there’s a service provider or data management system made specifically to help your organization address it. As a leading product in the field, Salsa CRM software is designed specifically to meet the unique needs of nonprofit organizations. Featuring heavy-duty data reporting and management tools within a user-friendly interface, Salsa’s software is perfect for nonprofits that need an effective all-in-one solution. 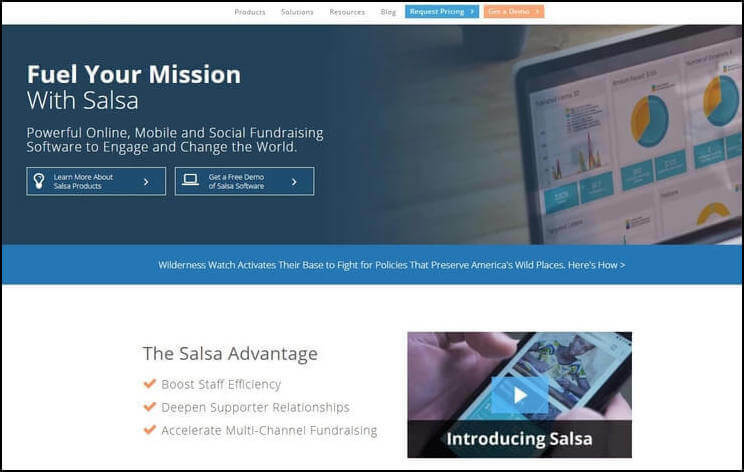 Plus, Salsa’s high-powered donor management software includes access to Salsa’s suite of online fundraising tools, making it an all-around smart choice for your nonprofit. With such comprehensive tools, the Salsa CRM and fundraising suite can help you manage and direct your nonprofit’s growth like never before! Since Salsa offers such a diverse range of customizable tools, prices for its CRM software vary according to each nonprofit’s exact needs. Reach out to Salsa for a custom quote or to schedule a free demo of their software! Check Out Salsa's CRM Software! As a top crowdfunding platform for nonprofits, Fundly consistently offers digital products and services perfectly designed to maximize the effectiveness of nonprofit fundraising campaigns! 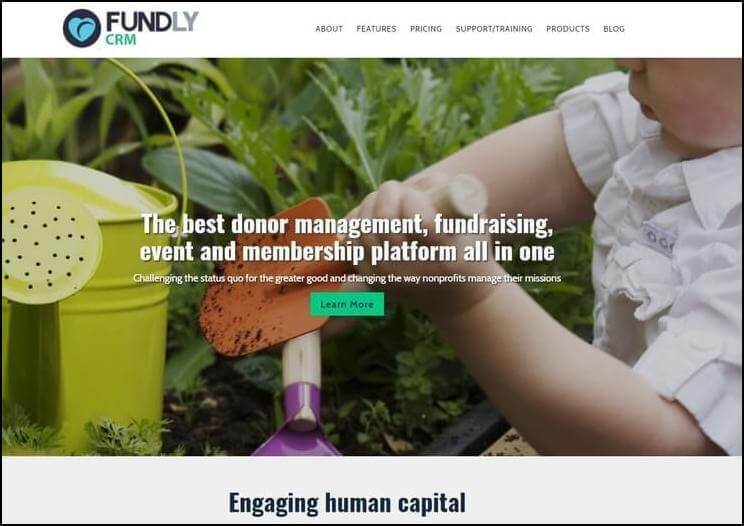 That makes Fundly’s CRM software solution, FundlyCRM, a perfect choice for nonprofits focused on increasing donations, managing campaigns, and boosting donor engagement all around. All of the features of FundlyCRM work together to help you improve the reach of your fundraising efforts and track crucial donor and campaign data better than ever before. Not only is its crowdfunding platform a reliable favorite for nonprofits, its CRM software also harnesses Fundly’s extensive fundraising expertise to bring you a suite of data and campaign tools perfect for organizing your next major fundraising effort! FundlyCRM is a great choice for nonprofits of all sizes because they offer 5 different software packages, ranging from $60 to $600 per month. Explore FundlyCRM’s site for more information about each package! As a CRM software solution geared specifically to identifying and collecting matching gift opportunities, 360MatchPro is a great choice for larger nonprofits with extensive donor databases. 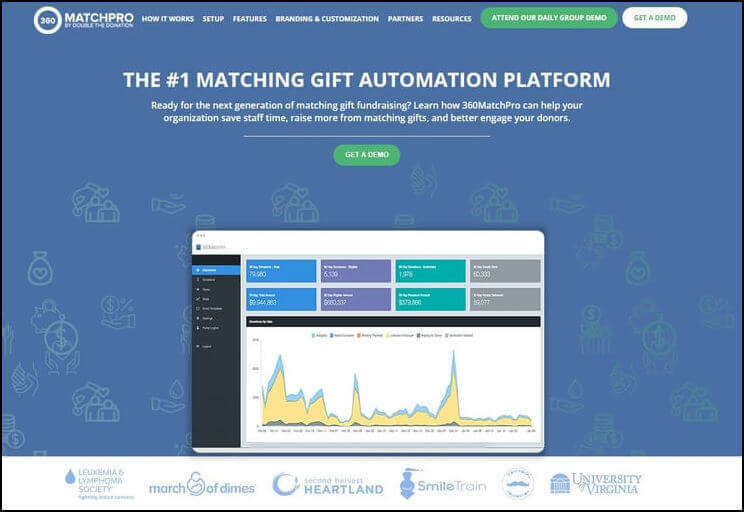 Designed to automatically identify opportunities for nonprofits to target corporate matching gift eligibility, 360MatchPro provides you with all the tools you need to dramatically boost your revenue simply by making use of your data in new ways. Especially for nonprofits with large donor lists, targeting matching gifts can be a smart move. Some corporate policies are extremely generous! If your nonprofit organization is ready to begin targeting corporate philanthropy programs, 360MatchPro’s CRM software and tools are the perfect choice! As a custom-built solution for larger nonprofit organizations, the cost for 360MatchPro’s CRM tools will vary. Contact them to request a customized quote, but in the meantime schedule a demo to see what matching gift data tools can do for your organization! Check Out 360MatchPro's CRM Tools! As a leading nonprofit CRM, DonorPerfect offers some great tools for managing and using your donor data to make smarter decisions. With effective data, fundraising, and engagement tools, DonorPerfect might be a smart move for your nonprofit. More specifically, DonorPerfect’s tools are designed to be scalable solutions for growing organizations. This makes DonorPerfect a great CRM suite for engaging your donors since your tools grow along with your relationships! 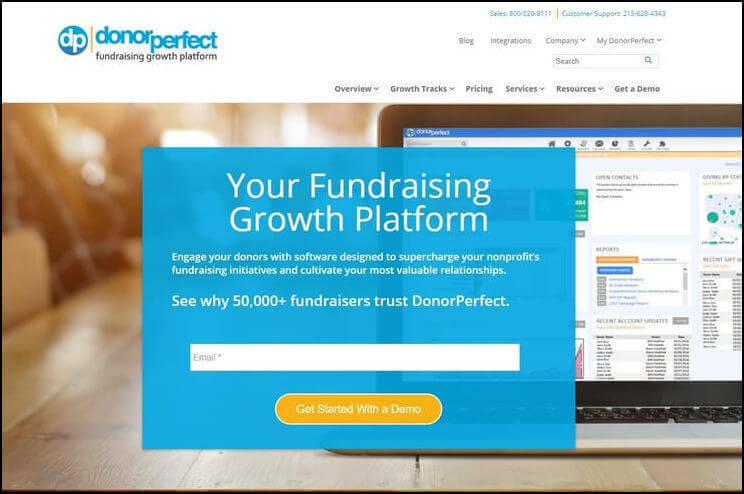 With a wide array of tools designed to help your nonprofit better engage your donors and constituents, DonorPerfect might be the right solution for your needs. DonorPerfect offers a range of CRM software packages that cost between $90 and $800 per month. However, since their suites of data and fundraising tools are highly customizable, contact them to determine which package will best suit your needs. 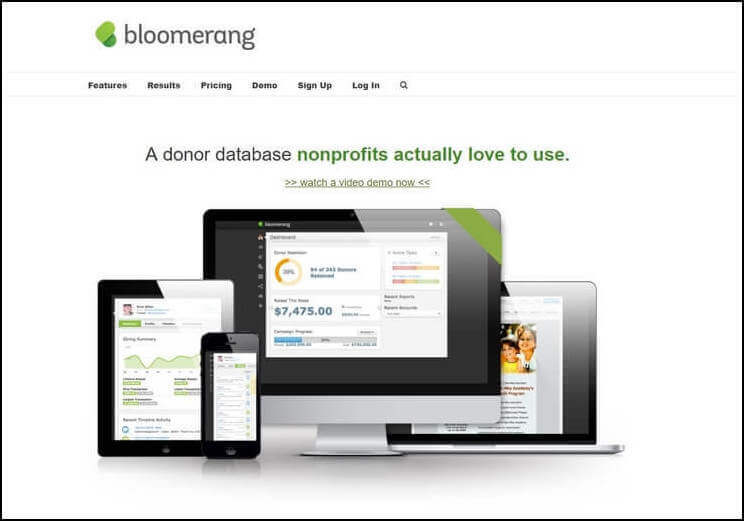 Built with input from leading thinkers and consultants in the nonprofit world, Bloomerang is a CRM software solution designed specially to help nonprofits increase their donor retention rates. With standard data reporting, automated marketing, and other CRM features, Bloomerang makes a strong option for nonprofits generally. Their special retention and tracking tools, however, are designed to boost donor loyalty and keep your nonprofit better connected to your base’s thoughts and opinions. Designed to help your entire approach remain organized and donor-centric, Bloomerang can help your organization identify the best areas to focus on for growth. Bloomerang offers a straightforward selection of CRM software packages ranging from $100 to $500 per month. Explore their site to find the package best suited to your nonprofit’s donor retention needs! Check Out Bloomerang's CRM Tools! 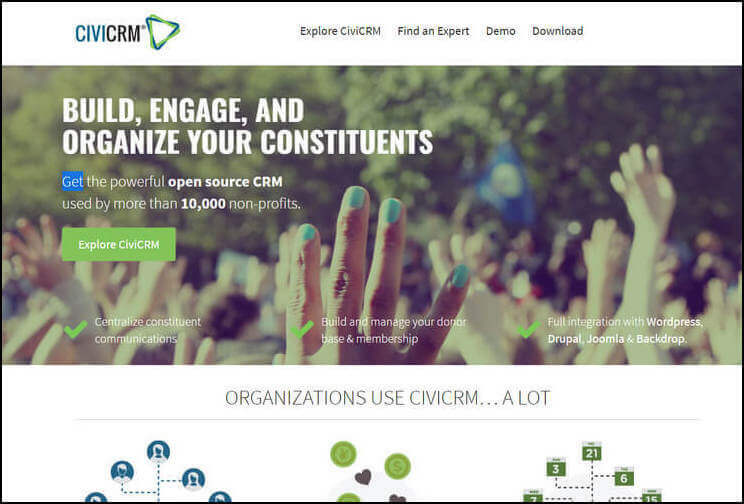 As an opensource software solution, CiviCRM is a crowdsourced CRM suite that addresses the needs of nonprofits of all sizes, particularly small to mid-sized organizations. Since they’re directly developed in response to the needs and feedback of the people using them, CiviCRM’s features are intuitive and easy-to-use, an extremely important quality for any software that your entire team will be using. This means, too, that the CiviCRM platform is completely customizable! It’s a strong choice for any nonprofit looking for new CRM software and tools. Plus, CiviCRM is compatible with most major custom website platforms, making it easy to integrate and collect donations. As an opensource software solution, the CiviCRM software and platform itself is free for nonprofits to download. However, you will need to purchase a license and likely hire a technology consultant to help your team best configure the software. Contact CiviCRM to discuss the best steps to take. 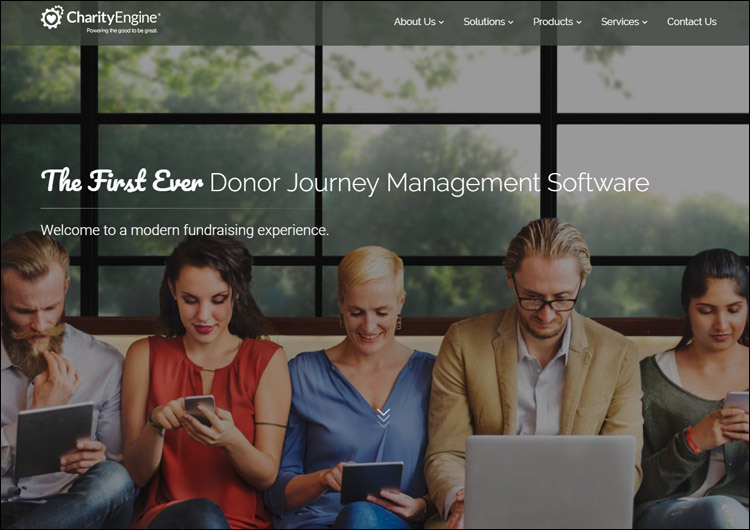 As opposed to other CRM solutions that require your nonprofit to purchase other marketing and fundraising software, CharityEngine is an all-in-one solution that makes it easy for your nonprofit to lead supporters through every stage of the giving process. With CharityEngine, you can segment supporters, craft emails that will best appeal to your audience, and encourage further involvement all from a single platform. Nonprofits of all sizes can use CharityEngine’s robust solution to build relationships with their supporters. No matter how you’re trying to engage your supporters, CharityEngine has the tools to make it happen. Their software is designed specifically to enhance and amplify the donor journey with your nonprofit. Contact CharityEngine to ask for a quote for this complete CRM solution. Although not specifically designed for nonprofit organizations, Bitrix24 offers a strong suite of CRM and other management tools that your organization could find useful. Designed around fostering organization and collaboration, this CRM platform makes it easy to keep every task on track and all data properly recorded in the correct place. Besides offering effective CRM and databases tools that can help you manage the logistics of your donation intake, Bitrix24’s communication platform, resembling a sort of internal social network, is a great way to keep your staff and volunteers connected and focused. Designed to be adaptive but fully comprehensive, the tools in the Bitrix24 CRM suite might be perfect to address your organization’s internal needs. 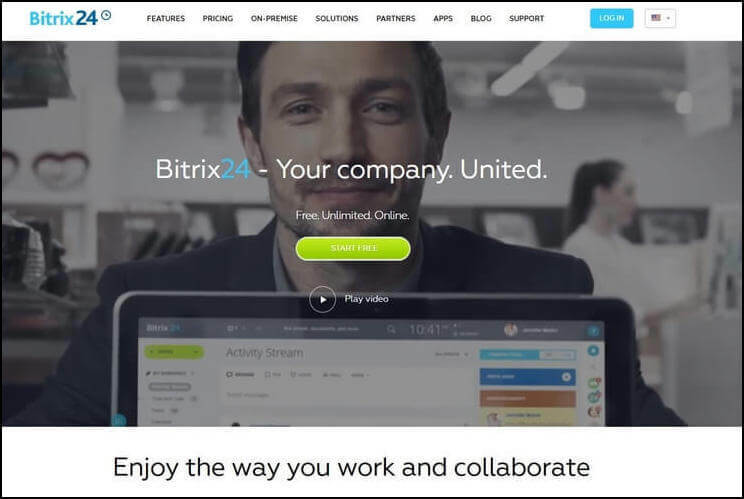 For a business-oriented CRM suite, Bitrix24 uniquely does not charge per-user fees. Instead, they offer a free very basic or trial version in addition to three other packages ranging from $40 to $200 per month. Check Out Bitrix24's CRM Tools! As the world’s leading CRM software for businesses of every size, Salesforce knows how to create extremely useful tools for making smarter decisions with data. While its suite of CRM tools isn’t designed for nonprofit organizations, it still offers a number of options that can make excellent choices for larger nonprofits and associations. 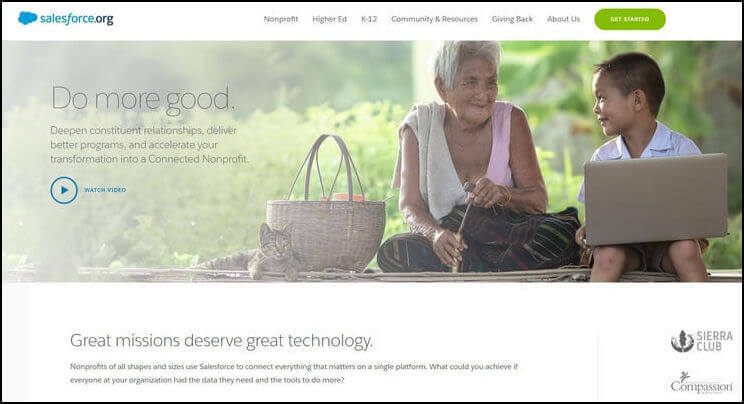 Salesforce offers a Nonprofit Success Pack, a small suite of their CRM tools re-adapted for use by nonprofits, that capitalizes on the platform’s most valuable asset — its huge global network of users. Be sure to explore Salesforce’s site for more information on their extensive offerings. The Salesforce AppExchange is an invaluable resource for customized tools and extra features. Through a special program, Salesforce will offer eligible nonprofits 10 free subscriptions to their basic Lightweight Enterprise Edition including the Nonprofit Success Pack. Even if your organization needs more support than this version offers, you can easily upgrade your package. Contact Salesforce for more information. Whether your organization needs a full data overhaul or just a tool to manage your data in new ways, always do your research when it comes to CRM software solutions! Many CRM products may look similar, but small very small differences can have a huge impact on how your staff use and adapt to the new platform. Most importantly, always identify software that was designed specifically for nonprofits or that offer nonprofit add-ons. Top Fundraising Software for Your Nonprofit. We picked 13 of our favorite software solutions designed to help nonprofits succeed. Check them out! Top 11 Nonprofit CRMs from Double the Donation. 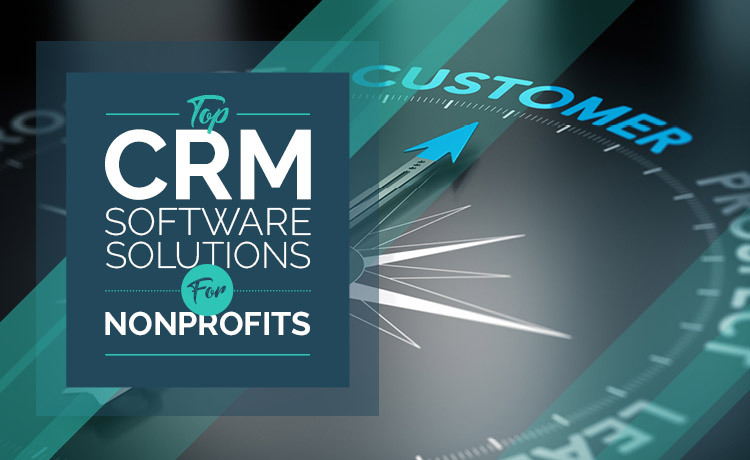 Continue your research and see some more top picks for nonprofit CRM software solutions! The Top 11 Nonprofit Consulting Firms. Sometimes hiring a nonprofit technology consultant is the best way to integrate a brand new platform into your operations!